Just remember this – DON’T EXPECT TOO MUCH OR YOU’LL BE DISSAPPOINTED. For us Brunei runners, we are happy the way it is. We come, We run, We lepak and Go Home. Do you know why there is this strange rule about what distance you can participate in, according to your age? Me and my friends (all women) are over 35, but wants to do the half marathon distance. Do you know how to go about this? just take category B - Women's Open 21km. It is an open age category. hello, I wonder if the running route is released? 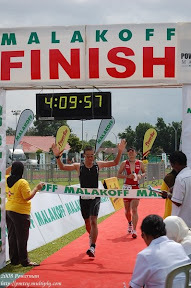 Huahhh~ gonna skip this race this year! Best wishes to all participants! Enjoy the momentum and indulge every leap cos one leap is a leap of change! (esply for newbs!) Good luck guys! really envy those who can!